The best part of our job is making our clients' spaces come to life and all their hopes materialize into reality. The family of three wanted to update their space and we were honored and privileged to be a part of their lives. 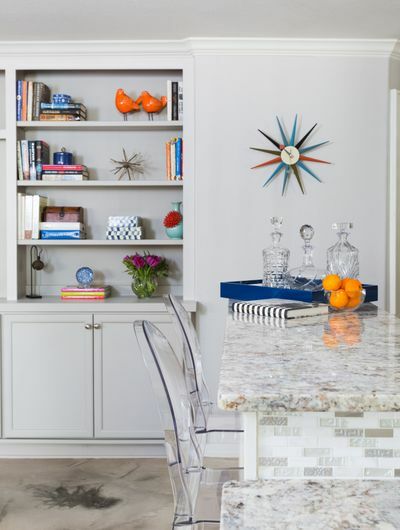 Color, light, and a love affair with mid-century modern brought this space to life. Join us today to see how this darling family and their fabulous home. Citrus shades acted as more than an accent, but also a binding to the story as a whole in each of the rooms. 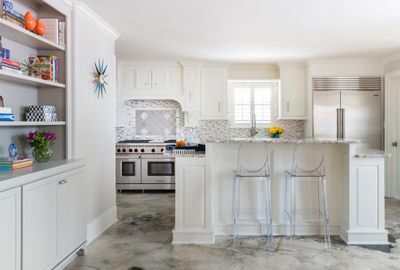 Updated crown molding, baseboard, and cabinetry in the kitchen made the 1970's build more updated in seemingly subtle, but impactful ways. 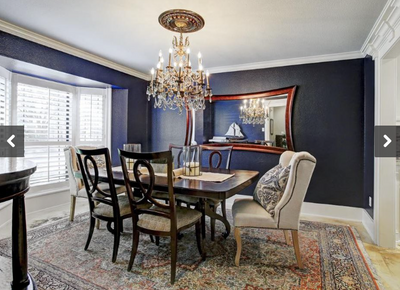 As Diane Cowan points out in her article in the Chronicle, the house had "good bones," but the Davis' needed a different space for their two younger children and college-bound oldest son. 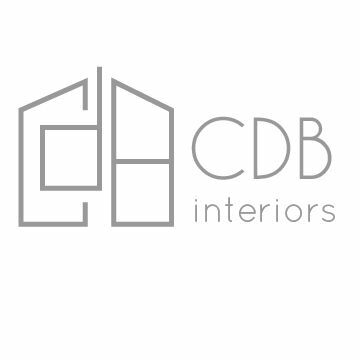 This is what CDB Interiors relishes-- creating a space unique and special to your family, not just for aesthetics, but for the function and safety for your family. Creating a place that is a refuge for our clients is the most satisfying part of our job. We love how these pieces from High Fashion Home, Laurie's Home Furnishing in Tomball, and some special items from Round Top. The family decided, wisely, to spend the bulk of budget on a nice sofa and chairs (always wise since these get major traffic! 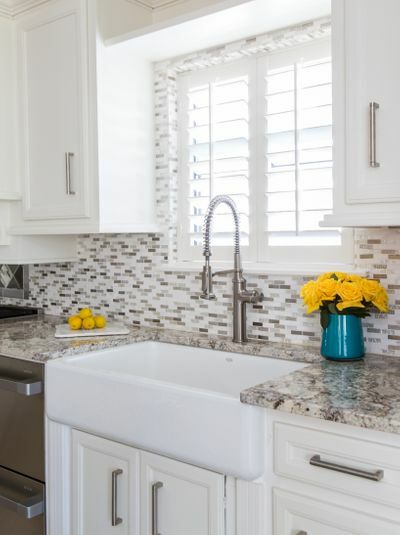 ), and use the more economical choices on items such as a kitchen clock and accents. 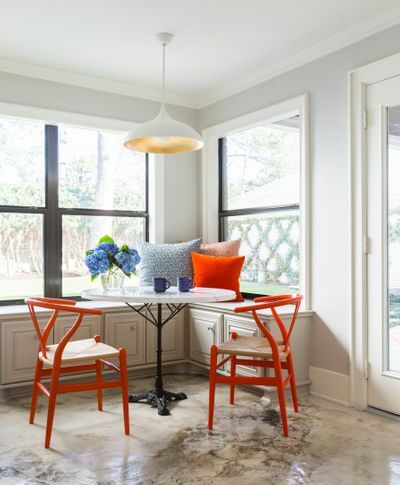 With all these creams, grays, and clean lines, we loved the breakfast nook's bright-orange Hans Wegner Wishbone chairs (found at Design Within Reach, a Vendor Spotlight!) 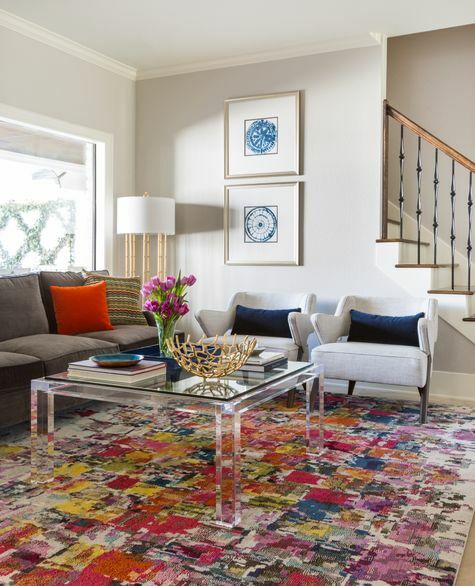 and the family room's bold, multicolored rug. See our before and after pictures below! What a difference some color makes! The floors look like concrete, but their a base of Venetian plaster and glaze. The two grey sofas, one in a darker, one in a lighter shade, are nestled around a modern acrylic coffee table (similar here). 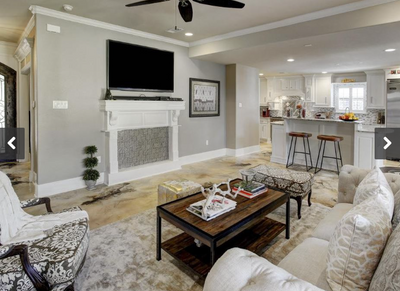 The family wanted a space that they could host a party, and the next day sit on the couch and eat a burger while watching football. All the furniture is stain resistant. 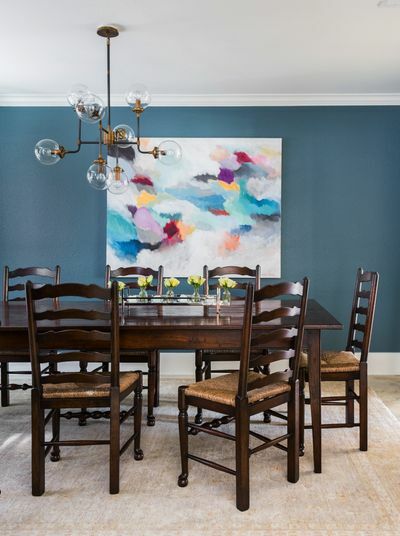 Venturing into the dining room, the custom teal walls, art from Renovate and Carl Moore Antiques chairs make this space dreamy and inviting, but completely sophisticated and original. "Midcentury style comes alive in the formal living room, with two acrylic chairs on metal faux bois frames and a bench of acrylic legs and a Tibetan sheepskin top," Cowan writes. We will refrain from rolling on the floor like a happy puppy on the lovely rug, but take our word for it--it not only looks darling, it makes the room a space to be coveted. 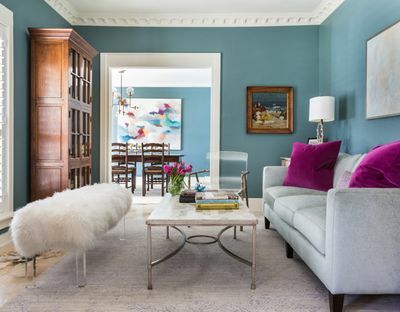 Pops of color bring the whole space to life. 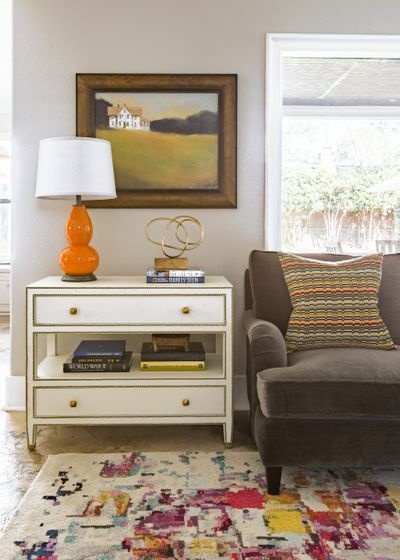 Fruity, bright, rich shades make the whole space tie together from room to room. 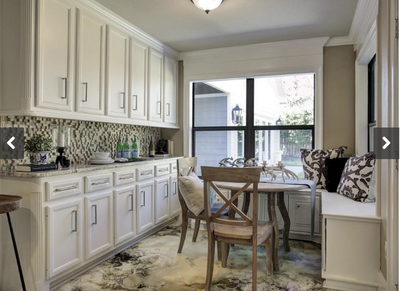 We adored this project and love becoming part of our clients' family.